The world is our habitat! Let’s commemorate this day in such a manner that it reverberates for a lifetime! 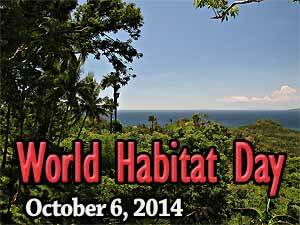 The first Monday in October is World Habitat Day. Designated by the United Nations, it was first commemorated in 1986 and continues to be recognized annually. This day is set aside to consider the basic right of all humanity to have adequate shelter, and remind people all across the world of our collective responsibility for the world habitat. The theme for World Habitat Day varies each year and for 2014 ‘Voices from Slums’ was chosen. With so many people living in poverty it may seem like a secondary consideration to protect nature. But it’s actually just the opposite. Clean water, air, and food resources are vital. They are important to everyone on the planet and provide a lifeline for the poorest. Within our world are many diverse habitats. The skies, lands, and waters each support a humongous and diverse amount of life. But we all know that these habitats are under siege from the activities and movements of mankind. We are impacting these environments by changing and expanding our settlements onto natural landscapes and making these habitats our garbage disposals and many life forms are suffering as the result. The most destructive and enormous impositions we are placing on world habitats are through the ongoing pollution of the waters and lands, and the deforestation of the lands. Two or the most poignant examples can be seen with the following world maps. 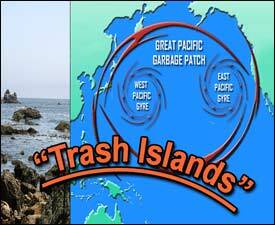 The “Great Pacific Garbage Patch,” also called “Trash Island” or “Garbage Island.” This is a growing mountain of floating garbage in the Pacific Ocean that covers an area at least the size of Texas, with some suggesting that it could even be larger than the United States itself. This image gives a good visual look at what using the ocean as a garbage disposal does, but it does not give any indication of the amount of debris that has settled on the ocean floor. Nor does it show the result of tons of sewage being dumped into the water, either directly or through polluted rivers and other waterways flowing into the ocean. Forests are so important to the balance of nature. At one time much of the Earth was covered by trees. 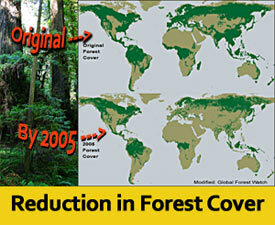 The majority of these forests were cleared long ago to make way for an ever expanding human population. Still that trend continues with forests being cleared for a variety of human support purposes including logging, agriculture, transportation routes, mining, and drilling. With the mass reduction of trees, mankind is working against itself and nature. One problem with removing trees has been found to cause species extinction. Macy Anonuevo, A recent article by Macy Anonuevo “Cutting down even just four trees in a forest can cause extinction” describes how quickly the loss of just a handful could wipe out entire species of flora and fauna forever.” Mammals are the most quickly affected followed by amphibians, birds, and invertebrates. Today we hear a lot about carbon dioxide (co2) and concerns about excess in the atmosphere. Co2 is actually a naturally-occurring chemical compound that’s an important building block of nature and is an absolutely essential part of all life. Yet it is just a small trace gas, and there are concerns about an increase in its concentration. Trees are masters at absorbing the co2 from the atmosphere and storing it long term, a process known as “carbon sequestration.” However, deforestation by burning is a widespread practice in the world’s tropical rain forests. This practice produces large amounts of co2 as well as carbon monoxide, methane, and other trace gases. Celebrate World Habitat Day by taking just one simple step = make protecting our habitats your personal responsibility every day. Amazingly the devastating forces in the enviroment are things that each of us has some direct control over. Taking personal responsibility is easy to do. Every time you walk outside, pick up any trash you see and dispose of it, and of course, don’t litter. Pay attention and be selective with the things you buy or use… and take care of how they are disposed of. To go even further, Offer your time and energy, or donate, to help groups and organizations that are working to clean up and recycle. These are just a couple of simple things you can do to personally help protect the World Habitats. We are all in this together and collectively we have the potential to create solutions to safeguard the future of our one and only planet. Have some other ideas? We’d love to have you share them!